2005 Bowman Chrome Baseball is a landmark issue that set the standard for the brand going forward. With a deep rookie checklist and the introduction of first-year one-of-one parallels, 2005 Bowman Chrome Baseball is one of the best sets of the decade. Leading the way are autographed rookie cards of Justin Verlander and Matt Kemp. 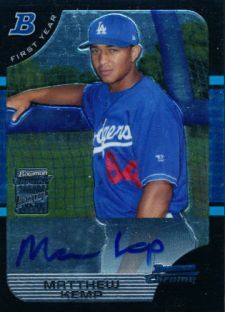 This is the only first-year autograph for Kemp (who is listed by his full first name of Matthew), making it an important card to track down as the slugger continues to emerge as one of the game's best. 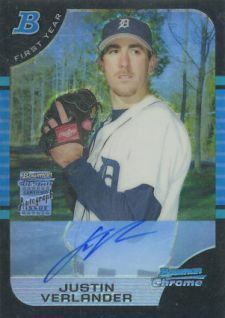 While Verlander does have several premium rookies that are worth more, the 2005 Bowman Chrome Baseball card is still available at a more accessible price tag while remaining extremely desirable thanks to the set's brand recognition. 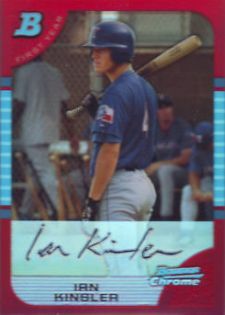 The other big autographed rookie card is Billy Butler. Unsigned rookies in the set include Russell Martin, Ian Kinsler and Jair Jurrjens. Because many of the rookies in this set show up again in Bowman Chrome Draft, collectors need to be careful about checking the numbers. Bowman Chrome Draft card numbers start with the prefix BDP. 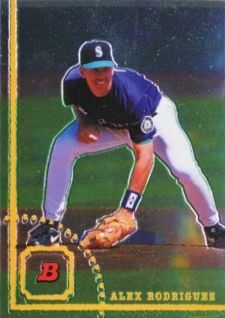 For players appearing in both sets, only the first 2005 Bowman Chrome Baseball card is considered a true rookie. Both Verlander and Martin fall into this category. Not only did refractor rainbows grow with the debut of rare Red Refractors numbered to five copies, Printing Plates and one-of-one Superfractors, but collectors were introduced to a new level of ultra high-end prospecting. Superfractors in particular represent the modern benchmark for the greatest rookie of a given player. 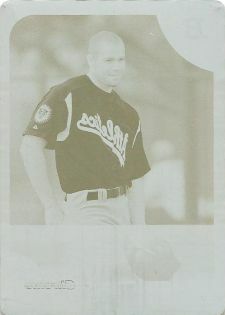 Alex Rodriguez is highlighted with his own insert set that made cards for the years he wasn't with Topps (1994-1997). A-Rod Throwback cards are inserted 1:9 pack. Parallels for the insert set include Refractors (/499), X-Fractors (/99) and Superfractors (/1). 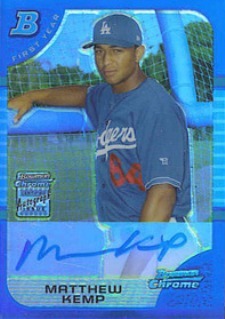 Rodriguez also signed 50 copies of the 1996 card and 99 copies of the 1997 version. 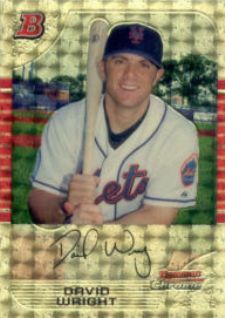 The 353-card 2005 Bowman Chrome Baseball set is broken down as follows: 140 veterans (#1-140), 25 young stars (141-165), 165 rookies (166-330) and 23 autographed rookies (331-353). One autographed rookie can be found in every hobby box. Hobby boxes hold 18 packs of four cards.